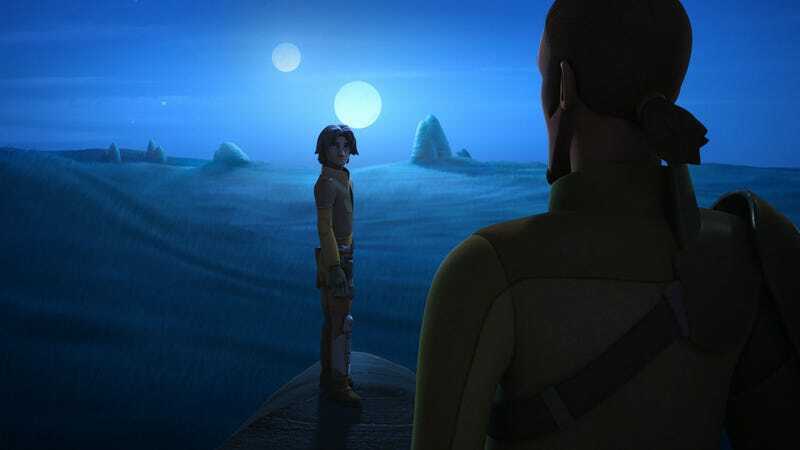 From the very first episode of Star Wars Rebels, Ezra Bridger has been alone. He lived and fended for himself. And now, with the help of his Jedi training and the Force, both Ezra – and the audience – know what happened to his parents. Before that could be revealed though, the episode – called Legacy – started with a vision. Ezra’s vision of his parents in a detention cell that looked exactly like one on the Death Star. He told his crew mates about it and they revealed they too have been looking for his parents, but have come up empty. However, a new clue and some help from The Force gives Ezra a lead – Lothal, his home planet, and an escaped prisoner, X-10. However, as a result of his mistake in the previous episode, the Empire beats them to their current location before they could leave for Lothal. Stormtroopers hit the ground along with Agent Kallus and the Inquistors. The result? One of the coolest action beats in Rebels to date, Ezra owning Kallus. Watch it. Once the Rebels get away, the battle continued right above the city. Hera exhibited some fancy flying including a great move where the Ghost clipped a piece off a Star Destroyer to stop a tractor beam. As that battle was happening, Hera told Kanan and Ezra to head off to check on his parents. They arrive on Lothal without incident, see a cat that Ezra recognized from his vision and chased it across the planet. At the end of the chase, they found Ryder Azadi, voiced by the awesome Clancy Brown. Azadi is a former governor of Lothal who had just escaped from prison. He knew Ezra’s parents and was actually as imprisoned with them because he backed their rebellious outcries years ago. The good news is that Ezra’s parents saw Ezra’s message of Rebellion from last season. It inspired them, and they orchestrated a mass prison break, one that resulted in Azadi’s escape and a bunch of others. However, they died in the escape, closing the chapter of Ezra’s life. It was a hard moment for him but thanks to The Force, and the mentorship of Kanan, Ezra was told that his parents will forever live in him. His pensive moment looking at the two moons over Lothal shared a deep DNA with Luke on Tatooine. Legacy was an oddly introspective episode of Star Wars Rebels. But it did it with a bunch of great action and a few nice nods to the original trilogy. The least of which was not a great use of John Williams’ Force theme. You can’t beat that. Rebels is going on a short hiatus, coming back in early 2016. I just wish we had something to fill our Star Wars fix until then.